Jac. de Vries produces specified exhaust systems. 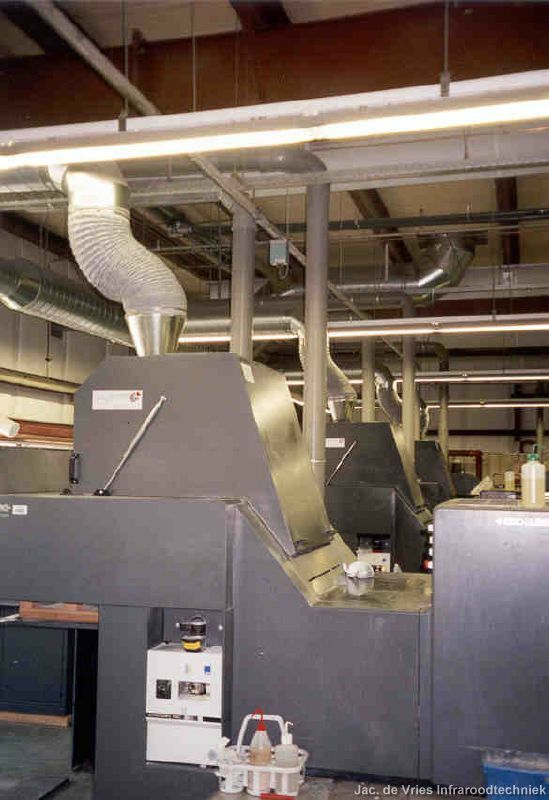 Our exhaust are well known for being the best in the market for infrared and hot-air drying. Next to this we produce specified exhaust installations for any other industrial application. Jac. de Vries exhaust systems directly discharge hot or polluted air, superfluous substances, solvents, etc. Our installations contribute considerably to an improved working climate (OSH legislation) and will reduce wear or pollution of machines. The Jac. de Vries exhaust installations can significantly accalerate the drying process, this results into production gains. Our exhaust systems can be made to measure as requested, and fully geared to the machine and the production process, but also to the type and quantity of the released substances. •	fan motor with continuous rpm control (for instance for flawless paper transport). Various filter systems, e.g. for dry spray powder, with or without automatic cleaning.